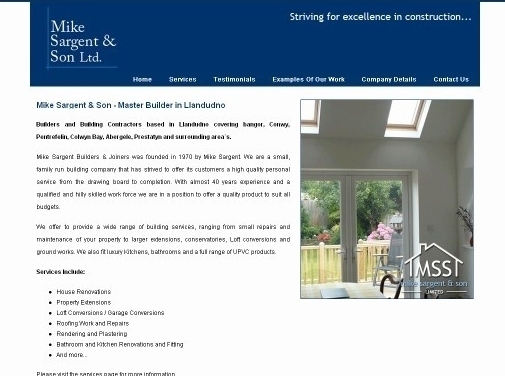 Mike Sargent Builders & Joiners was founded in 1970 by Mike Sargent. We are a small, family run building company that has strived to offer its customers a high quality personal service from the drawing board to completion. With almost 40 years experience and a qualified and hilly skilled work force we are in a position to offer a quality product to suit all budgets. UK (Conwy, North Wales) based company - established in 1970 - providing building services. Website includes details of services provided, associations belonged to, testimonials, work examples, full company contact details including company registration and VAT numbers.